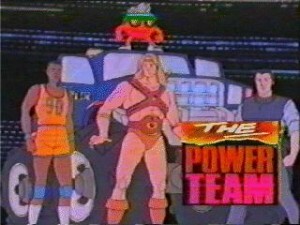 The Power Team was a 15-minute cartoon segment within the first season of Video Power, a show about video games. The show’s host Johnny Arcade would preview games, go over some tips, then introduce the Power Team segment. Although the show was produced by Acclaim, none of the characters in the show were from games developed by Acclaim, but rather games whose home versions were published by Acclaim. Led by Johnny Arcade (a cartoon version of Video Power’s host) Max Force (William’s Narc), Kuros (Rare’s Wizards and Warriors), Tyrone (Midway’s Arch Rivals), Kwirk (from the game of the same name by Atlus), and Bigfoot (Monster Truck whose game was produced by Beam Software) teamed up to fight Mr. Big and his band of villains. Makil, who also appeared in Captain N, made appearances on the show as well. Like Captain N, most of the characters had radical redesigns that left them different from their video game counterparts. However, unlike Captain N, these redesigns were a bit more thought-out and tasteful rather than having Mega Man being a little green dwarf who says ‘Mega’ before everything. Max Force looks more like a SWAT officer than the power-ranger wannabe from the games, Kuros, like on his game’s boxart, looked more like a barbarian than the generic knight he was in the games, Tyrone has an afro, most likely to keep him from resembling Michael Jordan like he did in Arch Rivals, and Mr. Big looks like a generic monster rather than the bizarre mutation you fight as NARC’s end boss. The show lasted all of one season, as season 2 of Video Power changed saw the show’s format changed by be more of a game show. Although the USA Network reran the episodes under the name ‘Acclaim Masters’, that would be the last we would see of this show. Of course it would live on in spirit, as other video games made it to the small screen throughout the 90s, most notably Street Fighter, Mega Man, and Mortal Kombat.